Podcasts by Mark Saunokonoko of 9News. Re: Podcasts by Mark Saunokonoko of 9News. Whatever is said I don't think any samples were kept so the resuults can never be checked. A Met Police team led by DCI Andy Redwood announced their wish to look again at forensic material collected in the early days of the Madeleine McCann investigation during a visit to the university town of Coimbra earlier this month. They met with senior officials of Portugal’s Institute of Legal Medicine and Forensic Sciences in Coimbra, two hours drive north of Lisbon, where most of the material, also said to include 25 blood and saliva samples, is held. “The tonic of the meeting was about the possibility of the tests on samples collected in 2007 being re-done. 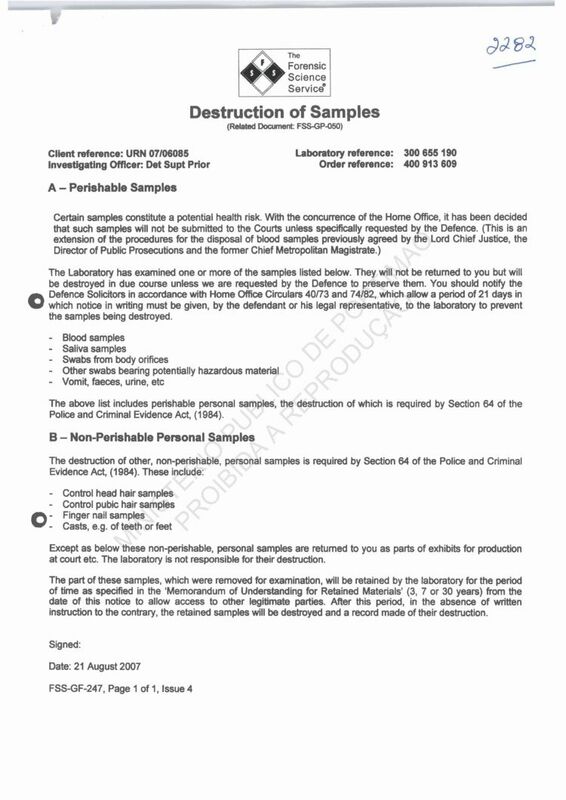 “The British police wanted clarification on the examinations the institute had carried out during the early stages of the inquiry in the areas of genetics and biology. “We talked about non-identified material that was collected in Madeleine’s apartment. “I can’t say for sure new DNA tests that didn’t yield a conclusive result in 2007 could now yield an objective result. “But technology nowadays allows us to go further than years ago in areas like genetic markers. “Several possibilities are open. One could be that British police do the tests in Britain with British technology and another that the institute does them. He's saying the dog never alerted to any other than which he was trained for in over 200 operational deployment's. Inconclusive means the FSS couldn't give an opinion about the presence of Madeleine's DNA. It wasn't ruled in or out. DNA testing isn't an exact science it involves interpretation. It couldn't be ruled out or in... Not due to interpretation... But due to the results of the analysis... Are you seriously suggesting another scientist could intepret that result diferrently... You are wrong.. So they were said to want to check the work of the Portuguese scientists but not that of the British ones. More insults imo. I suppose they had easier access to the relevant UK forensic records so didn't really need to mention it to anyone. I believe everything. And l believe nothing. I suspect everyone. And l suspect no one. I gather the facts, examine the clues... and before you know it, the case is solved!" Or maybe not - Fast approaching 12 years and still no solution. When Rebelo took over the investigation there was obvious personal contact and collaboration between Portuguese scientists and their colleagues at the FSS in Birmingham. They spent three days discussing nothing but the forensic results. The outcome of which relayed back to Portugal by their experts in the field must have convinced the public prosecutor to drop proceedings against the three arguidos. That says it all to me and I think it makes Saunokonoko's podcast crusade really quite extraordinary. The four-strong team from Portugal - thought to include a senior detective, two police forensic experts and Francisco Corte Real, the vice president of the National Pathology Institute - touched down at East Midlands airport at midday. "There has been excellent dialogue between the British and the Portuguese authorities but they found it was time to have a face-to-face meeting. ... public prosecutor Jose Magalhaes e Menezes has refused to sanction further moves against the couple. It has been reported that he is waiting for the full forensic results before deciding whether to pursue a case against them. I'm looking forward to listening to a real explanation of the genetic results from an expert in that field. I wonder if they will agree with Netflix genetic experts Robin Swan & Jim Gamble. It may just be me, but I get the feeling some people are suffering from squeaky bum time. You can tell me all that and the podcast hasn't aired yet. I don't suppose you could go a little further and tell me what's going to win the 2.15 at Wincanton, that's tomorrow as well. No I think the samples were returned to Portugal not kept in UK. Reference my previous advice re constructive comments guys. I have no problem with introducing a bit of banter into the discussions but please don't make remarks personal as that could constitute a rule breach. Cheers! If the expert, does like you say, tell us that the samples are inconclusive, why would I be shocked? Isn't that what the experts in the forensic report have already said? If you think I'll ever be shocked by the truth, whatever that may be, you've got me all wrong. If the expert says that the samples are now in their opinion, conclusive, then yes, I will be shocked, won't you? I don't have a crystal ball like some, I don't know what they are going to say. It depends entirely on what they do say that will determine if I'm shocked or not, don't you think?